Spottswood Thomas Bolling Jr. and his mother Mrs. Sarah Bolling. © The Washington Post by permission from the Washingtoniana Division. For at least a decade in Washington, D.C., the school where I taught, the John Philip Sousa Middle School, would only make the news when a neighborhood shooting would occur. But the site of my vocation had a great and glorious history, I discovered—one directly connected to the Civil Rights Movement. An article in The Washington Post revealed that Sousa had been designated a landmark by the National Park Service for its role in the desegregation of public schools in the District of Columbia. After sharing the article with each of my four technology education classes, my sixth-graders wanted to know “What is desegregation and why did it make Sousa a historic landmark?” My seventh- and eighth-graders wanted to know “Does this mean that Sousa will become a museum?” and “When and why was Sousa segregated?” “What does all this have to do with us right now?” Since I was unaware that Sousa was one of the schools cited in the famous 1954 Brown v. Board of Education Supreme Court decision, I had to conduct my research with my students: Students conducted internet searches, read, discussed, compared, and swapped research findings with one another. Although I perceived this as the perfect teachable moment, with built-in connections to the lives of my students, I never imagined that this effort would take on a life of its own as it continued to branch into different directions with broader and unexpected civil rights lessons before its completion. Even though the Civil Rights Movement is one of the most publicized stories of African Americans struggle for justice, it’s rarely discussed, or taught, in the elementary, middle, or junior high school curriculum. Since the District of Columbia’s students are predominantly African American, civil rights teaching is critical in enabling students to better understand and connect past and present issues of discrimination and inequity in their community and the larger society. For many of my students, the Civil Rights Movement seemed distant and disconnected from their lives. The questions and curiosity raised after reading the brief article on Sousa offered the perfect teachable moment and the best opportunity to connect the Civil Rights Movement to the very school, community, and lives of my students. 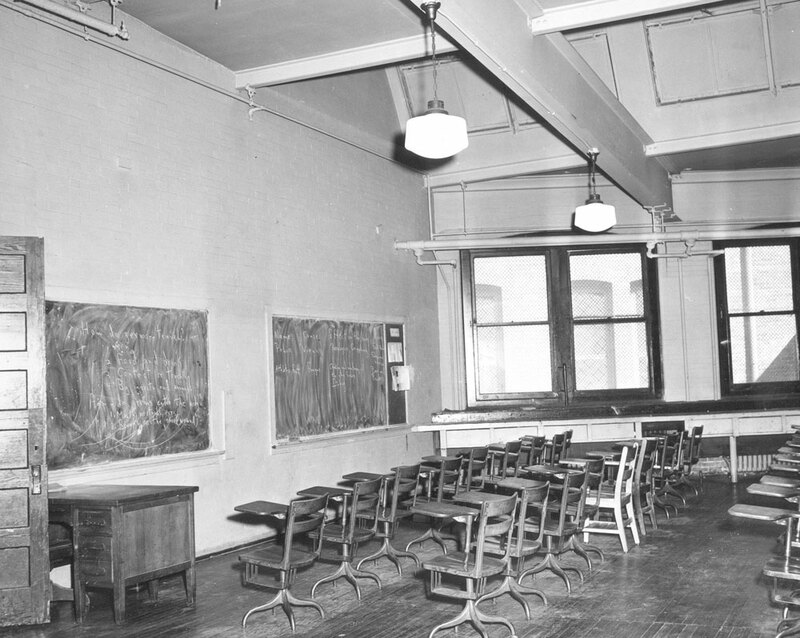 Bolling v. Sharpe was the primary lead for students to begin internet searches on the history of the school. Students with internet access shared or swapped their findings with classmates. Bolling v. Sharpe led them backwards and forward to other historical moments of the Civil Rights Movement. The Spottswood Bolling story led them to Brown v. Board of Education, then to Plessy v. Ferguson and the origination of the “separate but equal” law. After reading her child’s article about the Bolling case, one parent donated the two-part video of the movie “Separate But Equal.” Students viewed and discussed the movie in 30-minute clips throughout the various phases of the project. The movie was an important venue for adding a third dimension to this valuable lesson on the Civil Rights Movement. It literally brought the story as close to life as possible. As students became more curious about Spottswood Bolling, they began to ask parents, teachers, and community members about him. Their inquiry inspired them to read Through My Eyes to gain a deeper understanding of what it was like for black students like Linda Brown, Spottswood Bolling, and Ruby Bridges to be the first to integrate an all-white school. Examining racial discrimination through the eyes of a black girl growing up in the South and a black boy who grew up in their neighborhood, helped to deepen their understanding of racism, discrimination, and inequity and enabled them to identify current examples of each in their school, community, and institutions of the larger society. Although enhancing literacy was one of the underlying goals of the project, critical literacy became one of the more ambitious objectives. My desire was to not only read the lines of the text, but to also read between the lines. I wanted them to be able to answer questions about what they had read, while critically examining the text and questioning its validity. As a teacher committed to social justice, I believed that this would prove to be one of the most valuable lessons my students would gain from this project. Students, teachers, parents, and community members collaborated to identify persons from the community who could give expression to what it was like to grow up during this era. Rita Dozier, the PTA president and parent of one of my students, was able to contact William Wilson, a community representative who attended school with Spottswood Bolling. Mr. Wilson, a public school advocate and an icon in the Marshall Heights community, was also the President of the Ward 7 Council on Education and a member of the planning committee for Kelly Miller—the first new middle school ever to be constructed in the nation’s capital. He agreed to talk to my students about some of his school and personal experiences growing up as a black youth in the era of “separate but equal.” Students were shocked and awed by the fact that Mr. Wilson had been a classmate of Spottswood Bolling and the fact that he was still living in the neighborhood. He shared intricate details about how he walked over 30 blocks to and from Shaw Junior High School each day although Sousa was right across the street from where he lived. His story was a first-hand account of the story behind the story of Spottswood Bolling. Mr. Wilson’s story became history and had more validity than the articles pulled from the Internet. Students had so many questions that at their request, Mr. Wilson came back to serve as primary source throughout our study. On one of his return visits Mr. Wilson informed students that the D.C. Public Schools Board of Education had voted to allocate $14 million to demolish Sousa and build a new school on the site. He explained that as a result, Sousa would lose its status as a historic landmark. After much discussion about the pros and cons of razing versus renovation and the significance of preserving one’s history, the students agreed that the history of the school was too important to them and to the community to be destroyed. They knew that they had to make their case for saving the school’s designation as a historic landmark to the school board, the city council, and to the community. Kirk Washington, an eighth-grader, offered in his letter to the board what he considered to be the best argument for saving Sousa: “Because I am an African American and Sousa is an important part of my history.” So began a student-led campaign to save Sousa. Researching, reading, writing, and resisting became the order of the day. In addition to raising consciousness, another fringe benefit was increased student awareness of the power of the pen and the need to be able to express ideas using the written word. In launching the campaign several venues were considered. Students first concluded that their classmates, parents, teachers, and community members simply didn’t know enough about the school’s history or the significance of Bolling v. Sharpe to care about saving Sousa’s status as a historic landmark. So they devised a plan of action to inform other students, staff, parents, and community about Spottswood Bolling and his contribution to putting Sousa in the pages of history. Thus, another important lesson was garnered: the need to educate and inform the masses in order to engage them in the struggle to achieve their goal. At this stage, students were prepared to venture out and go wherever the cause led them to make their case. They seized the opportunity to present their own vision of a “renovated” Sousa in 3-D. Some students wrote articles for a special classroom publication called UPRISINGS. Letters were also sent to key board and council members, while other students drafted a petition supporting the renovation of Sousa. Several teams from each class volunteered to plan “Spotlight on Spottswood Bolling Day,” which had been designated by the principal at the students’ request. During the Spotlight on Spottswood Bolling Day, teams of four students were dispatched to each homeroom to conduct orientations about Bolling v. Sharpe and make the case for saving the school as a historic landmark. In class, the teams debriefed and critiqued their performance in delivery and knowledge of the subject. Some were overconfident about their delivery while others needed reassurance that they had done a great job. After reading the audience evaluations, they all felt a great sense of accomplishment. The universal willingness of students, teachers, support staff, and parents to sign the petition was an indication that the campaign was working. Students were starting to realize their own power. They now had the confidence and motivation to continue. Although the Architectural Planning committee and the board favored the least expensive option of razing Sousa to build a new one, they were obligated to seek community input before taking action. Neither the board nor the Architectural Planning committee anticipated student or authentic parent and community engagement in the final solution regarding Sousa’s capital improvement plan. Several students attended the Architectural Planning team’s community meetings. They noted that, other than Mr. Wilson, there were few people fighting to preserve the school’s historic landmark designation. Traditionally, parents in this low-income African-American community have neither been valued as informed decision makers nor had they been engaged in policy decisions made in or about the school. In general, civic engagement is negatively impacted by the District of Columbia’s lack of congressional representation. The failure of local school leaders in predominantly low-income communities of color to cultivate participatory decision-making is also a factor. It is not unfair to point out that a history of discrimination, based on race and class, continues to thrive in Washington, D.C., a city noted for the role it played in the racial desegregation of public schools in our nation. The 98 students working on the campaign to save the school decided to create their own vision of a renovated school. They learned from Mr. Wilson that compromising the integrity of the structure in any way would result in the school losing its designation as a historic landmark. Students decided that the school’s history was much too valuable to them and their community to have it destroyed. They decided that the structure must be saved. Renovation became the only option. As a prologue to the letter and petition-writing and conducting the school-wide orientations, they began plans for designing and constructing a scale model of their vision for the renovated Sousa. Each student chose an area of the school to re-design. Classrooms and labs, circulation spaces, cafeteria, main office, gymnasium, museum/lobby, auditorium, and playground were just a few of the main areas selected. Christina Hayunga, a volunteer architect, came to the school once a week for two months to advise the students about elements of design such as space, scale, and functionality—three essentials considered when planning any structure. After the models were completed and consolidated to make up the total school design, they were placed on exhibit at the Capital Children’s Museum for two months. An open house was held at the museum for students, parents, community members, and school staff at the end of the school year. At the National Writing Project’s Spring 2002 Conference, four of the students presented a part of the model, student articles from UPRISINGS, and reviews of the Supreme Court cases related to Sousa’s history. © Capitol Community News, Inc.
As they continued their investigation of the Spottswood Bolling story, students were ecstatic to learn that the board of education decided to allocate an additional $4 million for Sousa’s renovations. They were equally excited about the critical role they played in continuing the legacy of Spottswood Bolling. Students realized that they had gained a restored, state-of-the-art, 21st-century school while preserving Sousa’s status as a National Historic Landmark. They learned the power of collective actions to achieve a goal. They began to understand that the Civil Rights Movement was not merely one event orchestrated by one or a few people, but a series of events and actions, collaboratively and strategically planned and carried out by many to achieve equity and justice for all. More important, students began to understand how they continue to benefit from events that occurred over a century ago to secure civil and human rights for people of color. The research project helped them to see that the Civil Rights Movement is not really an era that has ended, but an ongoing struggle requiring their engagement as responsible citizens who seek to secure and maintain a just society for everyone. Most important, I believe that they learned the value and responsibility of rising up and resisting injustice. One thing I am certain that my students and I both learned is that there is no victory without struggle. History, particularly the historical events related to the Civil Rights Movement, has taught us that. Copyright © 2004 by Elizabeth Davis. Elizabeth A. Davis is a graduate of DC Public Schools and an award-winning DC Public Schools educator. After being recruited to teach drafting at Jefferson Junior High School in 1972 by the superintendent, the school’s principal tried to bar her from the job because she was female. Fighting for her right to teach – and her female students’ right to take classes – in a male dominated vocational education field set the tone for a life as an activist. During decades when many DCPS facilities were literally falling down around students and staff, Davis became known as a teacher who was unafraid to stand up to unsafe conditions, from water contaminated with unsafe levels of lead to tar fumes that were sickening students and teachers forced to stay in a school with a collapsed roof. Davis has been actively involved with many local and national education organizations including DC VOICE, Empower DC, Save Our Schools, the Ward 5 Education Council, the Delta Kappa Gamma International Society for Women Educators, the National Commission on Writing, the National Coalition of Education Activists, the DC Area Writing Project, Teaching for Change, and the National Writing Project. In 2013, Davis was elected president of the Washington Teachers’ Union, Local 6 of the AFT.